Fragrance… it is the eternal thread that runs through all our experiences, weaving them together into a most beautiful scarf of silken memories. It takes you by surprise. A simple step into my Dadi’s prayer room was enough for the fragrances to weave their magic and transport me back to Tirupati, in Chittoor District of Andhra Pradesh. People often have marvelous accounts of their pilgrimage to Lord Venkateswara’s famed temple situated at Tirupati. Yet all I remember is the dark, and the fragrance. The day I visited the temple, the statue wasn’t loaded with gold ornaments, as is customary, but was adorned by beautiful flowers. In the little chamber where we stood, the only source of light was the soft glow of the diyas burning at Lord’s feet. That day at Tirupati, I underwent a transformation. Intoxicated on that heavy scent, I was purged of all my sins. It felt as if I passed through God’s discerning eye and came through, shining better than ever. Such is the strength of this aroma that it makes you drop your baggage of fear and anxieties. It assures and reassures you that nothing can go wrong, that nothing bad can happen. For me, it symbolizes all that is pure and strong. The very scent of kapur gives me the strength and courage to fight for what I believe is right. However, the life I lead now does not afford me the luxury of indulging my senses in this most beloved of all fragrances. With work taking center-stage, my prayers are often nothing more than silent movements of my lips. Gone are the days when the fragrance of God used to be my home’s fragrance too. For exactly the past seven days, I’ve been holed up in my house. I haven’t met people, except those who inhabit/visit my home; I have felt neither the sun nor the rain on my skin; I haven’t been out in the fresh air; I haven’t lived. I’ve spent my days in a zombie-like state: Eating, Sleeping and Eating …in any order you prefer. Scary as it may seem, this horrid exclusion is exactly what thousands of children in India face when they’re diagnosed with HIV. During my two-month stay at Hyderabad, we visited Desire Society, a care home for children affected and infected by HIV/AIDS. The institute is home to about sixty-five children affected by HIV. During our interaction I came across two especially lovely girls, Lakshmi and Sirisha. There was an instant connection with these best friends. Was it the way they coyly approached me, the way the perfectly copied my steps as we danced to Bollywood hits or their sheer excitement when I met their pet rabbit… I will never know. In a country like India, where awareness about HIV is at sub-zero levels, any child infected with the virus at birth is treated as a curse to society. Food, family, shelter…they have nothing. Battling ill-health, these kids wage a war for survival every single day. It is a battle against an empty stomach, against an evil society that refuses to take them in its fold, against a system which systematically discriminates against them. What we need to understand is that shutting them out is not the solution. In India, roughly 80% of HIV infections in children are vertical, i.e. mother to child transmissions. The remaining 20% get infected owing to blood transfusions and sexual activity. Symptoms might appear as early as before a baby completes a full year of his life, to a few years later in the childhood. Since this deadly virus lowers the defense mechanisms of the body, these children are prone to opportunistic infections as well as neurological manifestations. They show an increased tendency to suffer the usual childhood infections, such as a common cold, with a magnified intensity. If left untreated, something as curable as diarrhea may be the cause of death. Unlike their counterparts at institutions like Desire Society, most children don’t have access to even such basic healthcare. Much more debilitating diseases follow. I find myself unable put in words the hardships they face. But I'm sure if you have the means to read this, you must know this already. The question is, what have we done to help? 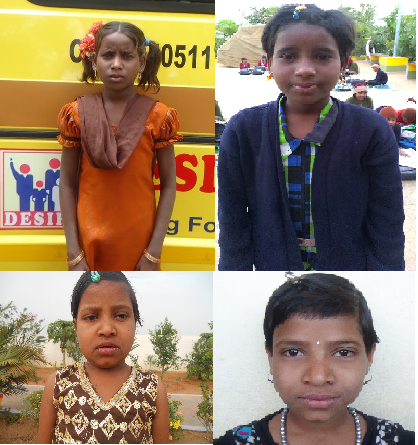 As grim as it sounds, Lakshmi and Sirisha also showed me the sunny side of their life. They might have lost their parents, but they have each other. They might have lost touch with the world, but they built their own. A world in which, surprisingly, people like me and you are always welcome. I know not if I will see them again. I know not if they’ll lead a healthy life. I know not if they’ll ever be accepted by society. But I do know their life is on track to becoming what it should be: Normal.